Afghanistan has been a central U.S. foreign policy concern since 2001, when the United States, in response to the terrorist attacks of September 11, 2001, led a military campaign against Al Qaeda and the Taliban government that harbored and supported Al Qaeda. In the intervening 16 years, the United States has suffered more than 2,000 casualties in Afghanistan (including 6 in 2018 thus far) and has spent more than $120 billion for reconstruction there. In that time, an elected Afghan government has replaced the Taliban, and nearly every measure of human development has improved, although future prospects of those measures remain mixed. While military officials profess greater optimism about the course of the war in early 2018, other policymakers and analysts have described the war against the insurgency (which controls or contests nearly half of the country’s territory, by Pentagon estimates) as a stalemate. Furthermore, the Afghan government faces broad public criticism for its ongoing inability to combat corruption, deliver security, alleviate rising ethnic tensions, and develop the economy. Contentious parliamentary and presidential elections, scheduled for October 2018 and April 2019, respectively, may further inflame political Meanwhile, a series of developments in 2018 may signal greater U.S. urgency to begin peace talks to bring about a negotiated political settlement, the stated goal of U.S. policy. 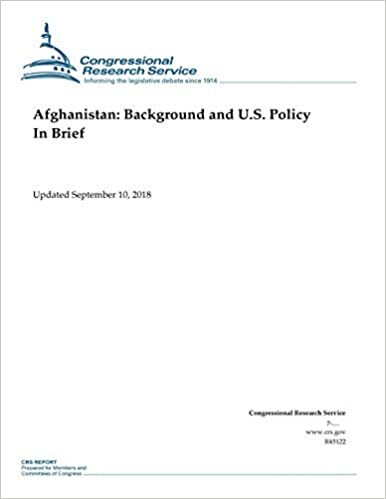 This report provides an overview of current political and military dynamics, with a focus on the Trump Administration’s new strategy for Afghanistan and South Asia, the U.S.-led coalition and Afghan military operations, and recent political developments, including prospects for peace talks and elections. Purchase this book.